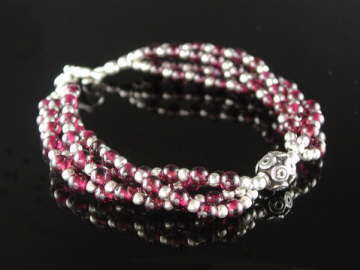 Beautiful multi-strand twist, pink Garnet bracelet, finished with a central, decorative, 925 sterling silver, bead. Garnet is the stone of health and commitment, said to aid the expression of devotion, love and understanding. It is also believed to be excellent in promoting self-confidance. A lovely, substantional bracelet finished with a sterling silver lobster clasp.